Dual logic system — choose the one that's best for you. Dual logic system — choose the one that's best for you. Supports both standard algebraic as well as RPN logic systems. RPN saves time and keystrokes, letting you avoid using parentheses and brackets. It also allows you to see intermediary results as you perform computations, letting you follow the stream of calculations. More than 250 functions available Includes currency and interest rate conversion, amortization and cash flow functions. 2-line display allows you to see more. Allows up to 22 characters per line. High-capacity memory for greater productivity. Case included. Calculator comes in black with gold facing. Attractive one line x 10-character LCD display; select business functions at your fingertips; great mix of statistic, business and math functions; r.ead display results easily, even at an angle. 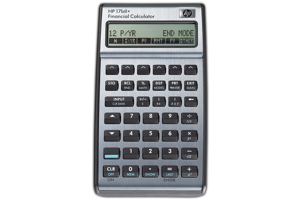 HP's large, angled, click-style keys allow you to minimize unwanted key presses 2-line x 22 character adjustable contrast LCD display Auto power OFF, after 10 minutes. TVM (loans, savings and leasing) Amortization List-based, cash-flow analysis Currency conversions Cash-flow functions: IRR, NPV, NFV and NUS Print table with infrared printer (hp 82240) Bond price and yield Depreciation methods: SL, DB, SOYD and ACRS Interest-rate conversions Percentage calculation: %CHG, %TOTL, MU%P, MU%C. Clock, calendar, appointments and alarm Date arithmetic (1582.10.15~9999.12.31) Number lists, edit, sort, store.